"Poul-A-Phouca, situated about half-a-mile south of Rusborough, the magnificent seat of the Earl of Miltown, on the left hand side of the great road leading from Blessington to Ballymore-Eustace, close on the confines of the County Wicklow, is a remarkable waterfall, formed by the ponderous and rapid descent of the whole body of the river Liffey. The name signifies 'The Pool of the Demon Horse,' it being an immense whirlpool. The breadth of the opening through which the water falls is but forty feet, and the height of the entire, from the upper stage beyond the bridge to the lower level, about one hundred and eighty. 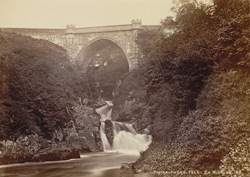 The quantity of water is not generally sufficient to confer grandeur on the scene, but after rainy weather it presents a noble picture: the mass of water is then considerable, and the fall of such a quantity over a declivity of this kind is a magnificent object; the hoarse roaring of the cataract may be heard at a distance of some miles. The abyss into which the water is precipitated from such a height has the appearance of a frightful vortex, into which all bodies that come down the stream are attracted with astonishing force and velocity. The bridge was built some years since, and consists of one Gothic or pointed arch, springing from rock to rock across the chasm through which the water rages. The span of the arch is sixty-five feet, and the key-stone is one hundred and eighty feet above the level of the river: there is a natural basing beneath the arch, in which, it is said, an unhappy tourist at one time met his fate, having fallen from the rock above."